People often ask me if they should change domain names, and I always shudder just a little. Changing domains is a huge, risky undertaking, and too many people rush into it seeing only the imaginary upside. The success of the change also depends wildly on the details, and it’s not the kind of question anyone should be asking casually on social media. The top three sites were active, with UserEffect.com being my former consulting site and blog (and relatively well-trafficked). The bottom two sites were both inactive and were both essentially gag sites. My one-pager, AreYouARealDoctor.com, did previously rank well for “are you a real doctor”, so I wanted to try to recapture that. I started migrating the 5 sites in mid-January, and I’ve been tracking the results. I thought it would be useful to see how this kind of change plays out, in all of the gory details. As it turns out, nothing is ever quite “textbook” when it comes to technical SEO. Why Change Domains at All? The rationale for picking a new domain could fill a month’s worth of posts, but I want to make one critical point – changing domains should be about your business goals first, and SEO second. I did not change domains to try to rank better for “Dr. Pete” – that’s a crap shoot at best. I changed domains because my old consulting brand (“User Effect”) no longer represented the kind of work I do and I’m much more known by my personal brand. from SEOmoz.org to Moz.com. That was a difficult transition that cost us some SEO ground, especially short-term, but our core rationale was grounded in the business and where it’s headed. Don’t let an SEO pipe dream lead you into a risky decision. Why did I pick a .co domain? I did it for the usual reason – the .com was taken. For a project of this type, where revenue wasn’t on the line, I didn’t have any particular concerns about .co. The evidence on how top-level domains (TLDs) impact ranking is tough to tease apart (so many other factors correlate with .com’s), and Google’s attitude tends to change over time, especially if new TLDs are abused. Anecdotally, though, I’ve seen plenty of .co’s rank, and I wasn’t concerned. It is absolutely shocking how many people build a new site, slap up some 301s, pull the switch, and hope for the best. It’s less shocking how many of those people end up in Q&A a week later, desperate and bleeding money. Planning is hard work, and it’s boring – get over it. You need to be intimately familiar with every page on your existing site(s), and, ideally, you should make a list. Not only do you have to plan for what will happen to each of these pages, but you’ll need that list to make sure everything works smoothly later. Since I wanted to focus on recent activity, and none of the sites had much new content, I restricted myself to a 3-month window (Q4 of 2014). Of course, I looked much deeper than the top 10, but the principle was simple – I wanted to make sure the data matched my intuition and that I wasn’t cutting off anything important. This helped me prioritize the list. Since the bulk of my main site was a blog, the top trafficked and top linked-to pages fortunately correlated pretty well. Again, this is only a way to prioritize. If you’re dealing with sites with thousands of pages, you need to work methodically through the site architecture. I’m going to say something that makes some SEOs itchy – it’s ok not to move some pages to the new site. It’s even ok to let some pages 404. 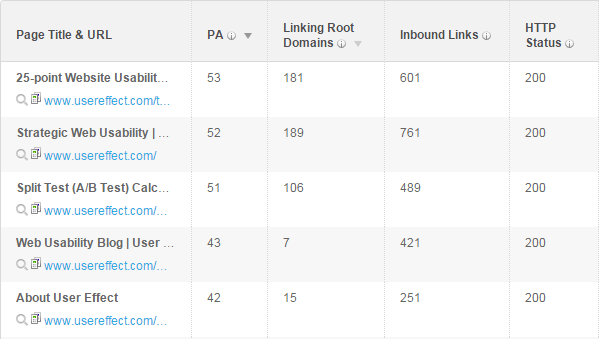 In Q4, UserEffect.com had traffic to 237 URLs. The top 10 pages accounted for 91.9% of that traffic. I strongly believe that moving domains is a good time to refocus a site and concentrate your visitors and link equity on your best content. More is not better in 2015. Letting go of some pages also means that you’re not 301-redirecting a massive number of old URLs to a new home-page. This can look like a low-quality attempt to consolidate link-equity, and at large scale it can raise red flags with Google. Content worth keeping should exist on the new site, and your 301s should have well-matched targets. into a new page on the new site. That way, I had a very well-matched target for the 301-redirect, instead of simply mapping the old site to my new home-page. I’m trying to prove a point – this is the amount of work I did for a handful of sites that were mostly inactive and producing no current business value. I don’t need consulting gigs and these sites produce no direct revenue, and yet I still considered this process worth the effort. Eventually, you’re going to have to make the move, and in most cases, I prefer ripping off the bandage. Of course, doing something all at once doesn’t mean you shouldn’t be careful. Remember that list you were supposed to make? It’s time to check it, or at least spot-check it. Someone needs to physically go to a browser and make sure that each major section of the site and each important individual page is resolving properly. It doesn’t matter how confident your IT department/guy/gal is – things go wrong. Don’t think that because you’re an “expert”, your plan is foolproof. Mistakes happen, and because I caught this one I was able to correct it fairly quickly. You don’t need to submit your site to Google in 2015, but now that Google Webmaster Tools allows it, why not do it? The primary argument I hear is “well, it’s not necessary.” True, but direct submission has one advantage – it’s fast. This isn’t really about getting indexed – it’s about getting nearly instantaneous feedback. If Google has any major problems with crawling your site, you’ll know quickly, at least at the macro level. XML sitemap structure. The basic idea is that, if you divide your sitemap into logical sections, it’s going to be much easier to diagnosis what kinds of pages Google is indexing and where you’re running into trouble. A couple of pro tips on sitemaps – first, keep your old sitemaps active temporarily. This is counterintuitive to some people, but unless Google can crawl your old URLs, they won’t see and process the 301-redirects and other signals. Let the old accounts stay open for a couple of months, and don’t cut off access to the domains you’re moving. Second (I learned this one the hard way), make sure that your Google Webmaster Tools site verification still works. If you use file uploads or meta tags and don’t move those files/tags to the new site, GWT verification will fail and you won’t have access to your old accounts. I’d recommend using a more domain-independent solution, like verifying with Google Analytics. If you lose verification, don’t panic – your data won’t be instantly lost. Once you’ve made the switch, the waiting begins, and this is where many people start to panic. Even executed perfectly, it can take Google weeks or even months to process all of your 301-redirects and reevaluate a new domain’s capacity to rank. You have to expect short term fluctuations in ranking and traffic. During this period, you’ll want to watch a few things – your traffic, your rankings, your indexed pages (via GWT and the site: operator), and your errors (such as unexpected 404s). Traffic will recover the fastest, since direct traffic is immediately carried through redirects, but ranking and indexation will lag, and errors may take time to appear. always goes down on Saturday. This one’s a bit trickier – the first spike, on January 16th, is when I redirected the first domain. The second spike, on January 22nd, is when I redirected UserEffect.com. Both spikes are meaningless – I announced these re-launches on social media and got a short-term traffic burst. What we really want to know is where traffic is leveling out. 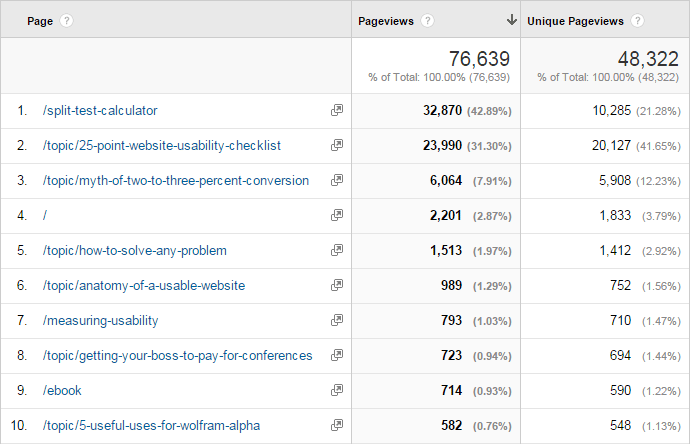 Of course, there isn’t a lot of history here, but a typical day for UserEffect.com in January was about 1,000 pageviews. The traffic to DrPete.co after it leveled out was about half that (500 pageviews). It’s not a complete crisis, but we’re definitely looking at a short-term loss. The first set of pages was indexed fairly quickly, and then the second set started being indexed soon after UserEffect.com was redirected. All in all, we’re seeing a fairly steady upward trend, and that’s what we’re hoping to see. The number is also in the ballpark of sanity (compared to the actual page count) and roughly matched GWT data once it started being reported. So, what happened to UserEffect.com’s index after the switch? The timeframe here is shorter, since UserEffect.com was redirected last, but we see a gradual decline in indexation, as expected. Note that the index size plateaus around 60 pages – about 1/4 of the original size. This isn’t abnormal – low-traffic and unlinked pages (or those with deep links) are going to take a while to clear out. This is a long-term process. Don’t panic over the absolute numbers – what you want here is a downward trend on the old domain accompanied by a roughly equal upward trend on the new domain. The fact that UserEffect.com didn’t bottom out is definitely worth monitoring, but this timespan is too short for the plateau to be a major concern. The next step would be to dig into these specific pages and look for a pattern. The old domain is dropping out of the index, and the new domain is taking its place, but we still don’t know why the new site is taking a traffic hit. It’s time to dig into our core keyword rankings. The new site took over the #1 position from the old site at first, but then quickly dropped down to the #3/#4 ranking. That may not sound like a lot, but given this general keyword category was one of the site’s top traffic drivers, the CTR drop from #1 to #3/#4 could definitely be causing problems. Here, the new domain is ranking, but it’s showing the old title tag. This may not be cause for alarm – weird things often happen in the very short term – but in this case we know that I accidentally set up a 302-redirect. There’s some reason to believe that Google didn’t pass full link equity during that period when 301s weren’t implemented. Let’s look at a domain where the 301s behaved properly. Before the site was inactive, AreYouARealDoctor.com ranked #1 for “are you a real doctor”. Since there was an inactive period, and I dropped the exact-match domain, it wouldn’t be surprising to see a corresponding ranking drop. Early on, I also spot-checked this result, and it wasn’t showing the strange title tag crossover that UserEffect.com pages exhibited. 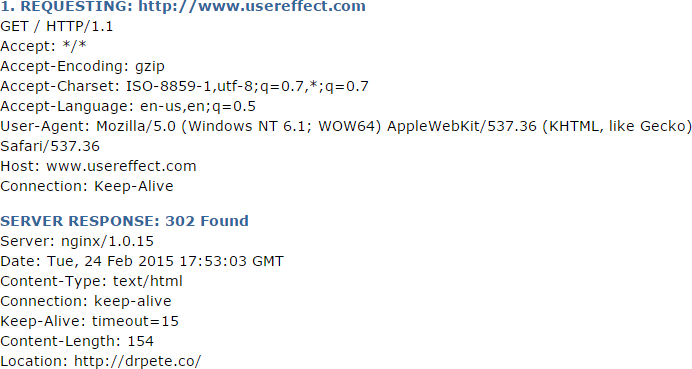 So, it’s very likely that the 302-redirects caused some problems. Of course, these are just a couple of keywords, but I hope it provides a starting point for you to understand how to methodically approach this problem. There’s no use crying over spilled milk, and I’m not going to fire myself, so let’s move on to checking any other errors that I might have missed. The old site had a “/blog” directory, but the new site put the blog right on the home-page and had no corresponding directory. Doh. Hey, do as I say, not as I do, ok? Obviously, this was a big blunder, as the old blog home-page was well-trafficked. The other two errors here are smaller but easy to correct. MinimalTalent.com had a “/free” directory that housed downloads (mostly PDFs). I missed it, since my other sites used a different format. Luckily, this was easy to remap. The last error is a weird looking URL, and there are other similar URLs in the 404 list. This is where site knowledge is critical. I custom-designed a URL shortener for UserEffect.com and, in some cases, people linked to those URLs. Since those URLs didn’t exist in the site architecture, I missed them. This is where digging deep into historical traffic reports and your top-linked pages is critical. In this case, the fix isn’t easy, and I have to decide whether the loss is worth the time. What About the New EMD? My goal here wasn’t to rank better for “Dr. Pete,” and finally unseat Dr. Pete’s Marinades, Dr. Pete the Sodastream flavor (yes, it’s hilarious – you can stop sending me your grocery store photos), and 172 dentists. Ok, it mostly wasn’t my goal. Of course, you might be wondering how switching to an EMD worked out. There was an initial drop, after which the site evened out a bit. This less-than-impressive plateau could be due to the bad 302s during transition. It could be Google evaluating a new EMD and multiple redirects to that EMD. It could be that the prevalence of natural anchor text with “Dr. Pete” pointing to my site suddenly looked unnatural when my domain name switched to DrPete.co. It could just be that this is going to take time to shake out. If there’s a lesson here (and, admittedly, it’s too soon to tell), it’s that you shouldn’t rush to buy an EMD in 2015 in the wild hope of instantly ranking for that target phrase. There are so many factors involved in ranking for even a moderately competitive term, and your domain is just one small part of the mix. I hope you learned that I should’ve taken my own advice and planned a bit more carefully. I admit that this was a side project and it didn’t get the attention it deserved. The problem is that, even when real money is at stake, people rush these things and hope for the best. There’s a real cheerleading mentality when it comes to change – people want to take action and only see the upside. Ultimately, in a corporate or agency environment, you can’t be the one sour note among the cheering. You’ll be ignored, and possibly even fired. That’s not fair, but it’s reality. What you need to do is make sure the work gets done right and people go into the process with eyes wide open. There’s no room for shortcuts when you’re moving to a new domain. That said, a domain change isn’t a death sentence, either. Done right, and with sensible goals in mind – balancing not just SEO but broader marketing and business objectives – a domain migration can be successful, even across multiple sites. To sum up: Plan, plan, plan, monitor, monitor, monitor, and try not to panic.